Great inspiration! 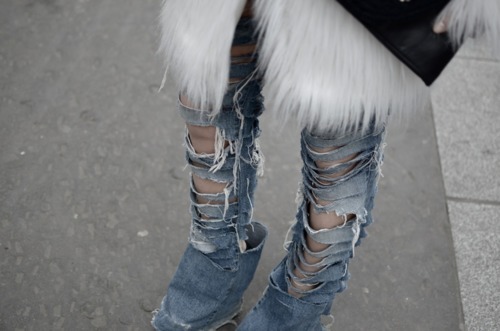 I have yet to find my perfect pair of destroyed jeans! Simply perfect post. I love jeans, especially the damaged ones!!! So inspiring !! Great post ! Vedette Shapewear surprise gifts to win ! I love that floppy blue clutch! nice pictures! i love the ripped jeans paired with somathing preppy! fabulous combination!!! Im so inlove with J E A N S! you are very beautiful girl! You have such gorgeous hair! http://iherb.com/?rcode=EVO218 sells over 19,000 natural products and offers UPS Ground Shipping 4 $ to orders over $ 40.00. Discount on first order of $ 8! Beautiful, love the torn looks! wonderful jeans! so chic destroy! ποσο τα αγαπω αυτα τα παντελονια!! !σε ολους τους δυνατους συνδυασμους!!! I absolutely loved this post!! And I love your blog! Distressed jeans are my fave comfy look. Love these chic rag doll outfit inspirations.